RBC | Since Jan. 1, restrictions on collecting shed antlers have been in effect on all public lands west of Interstate 25, through April 30. Additional restrictions apply in the Gunnison Basin. Colorado Parks and Wildlife officials say anyone caught in possession of or collecting sheds illegally during this time —including shed horns and antlers and horns naturally attached to a skull plate—will face fines if they ignore the law. The restrictions do not apply to private lands; however, CPW officials remind everyone trespassing laws are always in effect. As deer, elk and moose begin dropping their antlers in late winter, hundreds of collectors begin an intense, daily search for the freshest sheds—considered the most valuable—while the animals are still on their winter range and essentially starving. 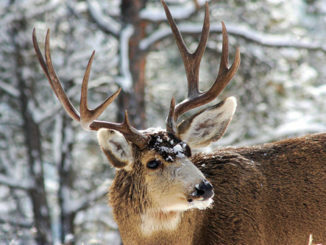 In a few egregious cases, witnesses have observed some shed collectors chasing a herd of elk or deer with an off-road vehicle in an attempt to secure a fresh shed dropped by a startled animal.